The second woman to hold the position of Chief Justice of the Brazilian Federal Tribunal (STF), Cármen Lúcia Antunes Rocha leads the judicial branch at a critical moment in Brazilian history. The Lava Jato investigations have exposed widespread corruption and questionable campaign financing practices involving senior figures in the public and private sectors. In the coming months and years, the STF—Brazil’s Supreme Court—will take a leading role trying many of these cases, including criminal cases involving members of the Brazilian Congress and of the presidential cabinet. As president of the Court, Justice Cármen Lúcia will need to guard it against perceptions of partisan bias as it passes judgement on powerful politicians. At the same time, she and her colleagues will have to preserve the mission of the STF as a constitutional court while tackling a number of criminal cases imposed on the court by the constitutionally mandated “privileged forum” enjoyed in Brazil by federal elected officials and members of the presidential cabinet—itself a topic of controversy. Since her term began in September 2016, Chief Justice Cármen Lúcia has already withstood several early challenges, including the untimely passing earlier this year of Justice Teori Zavascki, the Lava Jato rapporteur, and the recent conclusion of the Odebrecht plea bargain testimonies, which have led the federal prosecutor's office to request approval from the Supreme Court to open of dozens of new inquiries related to the case, leading potentially to more criminal indictments. 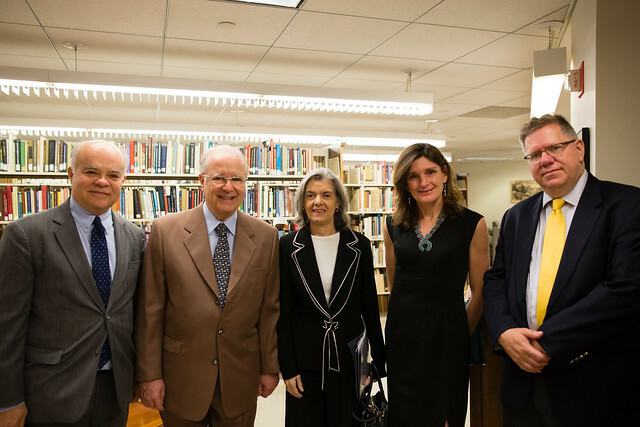 On April 10th, Chief Justice Cármen Lúcia will speak at the Wilson Center as part of the ongoing lecture series on the Rule of Law in Brazil. The series, which began in July of last year, is co-sponsored by the Brazil Institute and the Washington College of Law at American University. This event is also sponsored by the Global Women’s Leadership Initiative and Women in Public Service Project at the Wilson Center. Bio: Justice Cármen Lúcia was nominated to the Supreme Court in 2006 by President Luiz Inácio Lula da Silva. During her time on the bench, she also served as chief justice of the Superior Electoral Court of Brazil. Prior to her appointment, she served as prosecutor for the state of Minas Gerais. Justice Cármen Lúcia obtained her law degree at PUC Minas, where she was a professor of constitutional law, and has a master's degree in Constitutional Law from UFMG. She recently announced plans to begin teaching law again in 2018.